Rio is amazing of course, but for relaxing and leisurely touring my favorites are Porto Alegre and Curitiba in the south. Lucky for me, my wonderful Brazilian friends — brilliant professor Clovis and public administrator Themis — live in Curitiba (pronounced "Cura-cheeba"). To students of urban design and sustainability, Curitiba has been world famous since it was transformed in the 1970s by mayor Jaime Lerner. (See his provocative TED talk here.) Under his aggressive leadership, Curitiba built a fast, efficient Bus Rapid Transit with dedicated express lanes that operates like a light rail system at a fraction of the cost. It's been copied by many cities around the world. The typically bold feature element in the art museum Oscar Niemeyer designed for Curitiba is often described as the "eye," but some contend it was really inspired by the unique Araucaria pine trees in southern Brazil. To mention just three of the many other achievements, Curitiba also created a massive recycling system (said to be the best in the world at the time), one of the largest downtown pedestrianized shopping areas in the world, and many large beautiful parks that make the urban area more livable and help control floods. Businesses have thrived and Curitiba went from below average to become one of the most affluent cities in Brazil. 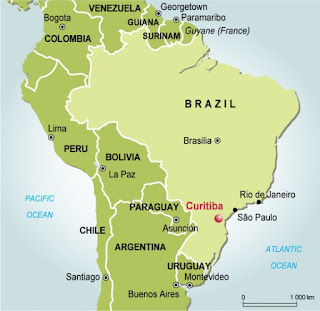 Now headed toward two million people, Curitiba is the largest Brazilian city south of Rio and São Paulo. It is not without challenges as this NYT account explains but it is still a remarkable place. artistry in my small cappuccino cup.